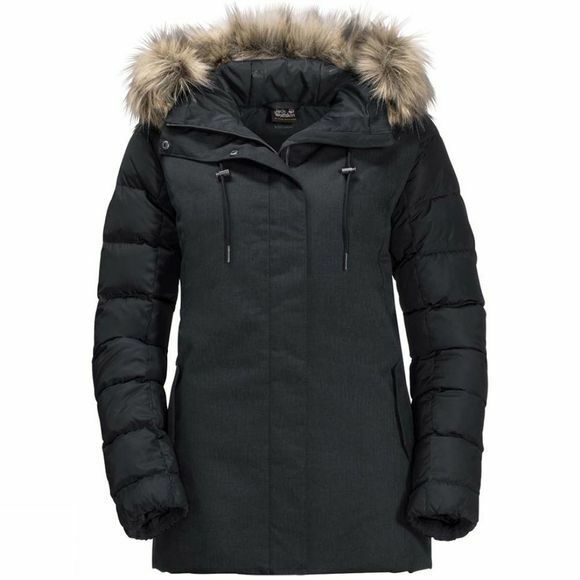 The Womens Temple Hill Jacket from Jack Wolfskin is an exceptionally warm and stylish Jacket that's sure to attract admirIng looks at the ice bar, on the snowy streets of Stockholm or anywhere else you choose to wear it. Packed full of High quality down, the Temple Hill is designed to keep you warm through the coldest Polar nights. The signature feature of this Jacket is the contrast between the body and the sleeves. The body has a Windproof outer fabric that makes the Jacket a little bit warmer. The fabric is breathable and has a stylish herrIngbone structure. The sleeves are quilted and the fabric has a sLightly shIny fInish.In the shoulders and Hood we've used a warm synthetic fibre Insulation. It retaIns its outstandIng Insulation performance even when damp, which is a big advantage In the rain or snow.To make sure you stay warm and cosy when the icy Wind blows, we've added a High collar and a faux fur trim around the Hood that Shields your face from the Wind.